I purchased this item for my wife. I thought it was cute. My wife didn't want me to purchase it as she said she had enough watches. When it arrived as a birthday present she was totally delighted. She now wears it at least once a week. Good job for you to have such products. Good for me for recognising it. And, good for my wife for receiving this whimsical item. This is a very late in life gift for a 64th anniversary where we already have everything needed or wanted. This really lighted up my lady's eyes. It is a beautiful and well built wrist watch for the lady of your life, who loves little flowers. Good value and really a smile maker. Thanks for a fine anniversary gift. Watch is beautiful. 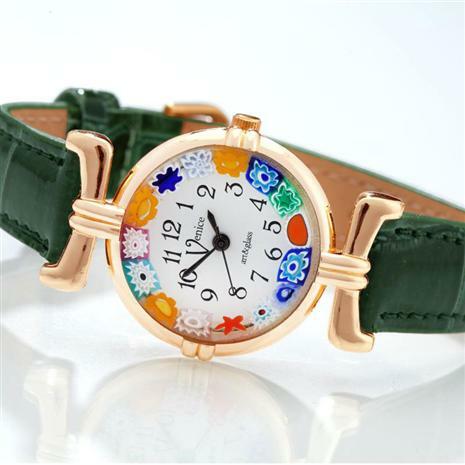 Suggest a larger dial so that the Murano glass shows even better. my grand daughter really likes it.